At the heart of Oriental Harbor is our Marina with 110 deep-water boat slips, serving both private and transient boat owners. It is a center for fishing charters, a sailing school, and yacht sales. Boat repair service and dry dock facilities are within walking distance. You will find us where the Neuse River and Greens Creek flow into Pamlico Sound on the Intracoastal Waterway, mile marker 182. The nearby federal channel makes for easy maneuvering. From Oriental Harbor, a skipper can reach any number of seaports, historic river ports and secluded anchorages. There is easy access to the Chesapeake Bay to the north, and south to Florida and the Caribbean. We are only 24 miles from Beaufort Inlet, an all-weather gateway to the Atlantic Ocean and beyond. Our slips range in length from 30 to 50 feet. They are constructed of concrete decking with wood trim. Power and water services are available at each slip. Fuel is available nearby. Other amenities include pump-out, showers, laundry facilities, and high speed wireless internet service. A professional dockmaster and staff will gladly arrange repair services for your boat. Next door, in the Village Center, you will find the Water Street Grill along with other marine related services. Slips are individually owned and deeded, and are governed by a slip owners' Association. Monthly dues are assessed to cover operational costs and to build a capital reserve account. 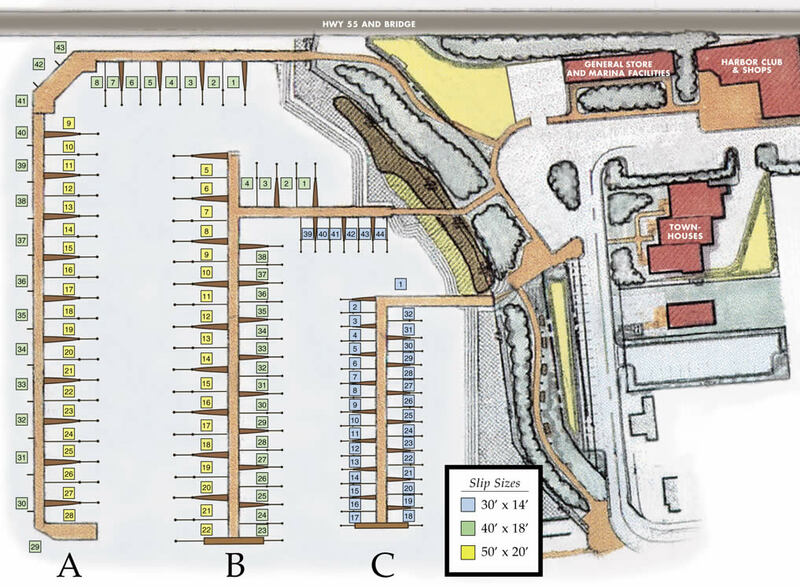 The Marina Plan below shows more about Oriental Harbor Marina. Please call or e-mail us for the most up-to-date slip availabilities. A limited number of boat slips are available for monthly rental. All of the amenities and services detailed in the Boat Slips section above are offered to our rental guests. Call for current rates. Electricity is metered at the slip. Contact Oriental Harbor Real Estate @ 252-671-9692 for more info.